This vegan burrito makes the perfect breakfast, lunch, or dinner. I mean, when can you NOT have a burrito? Especially when it's this delicious AND satisfying. 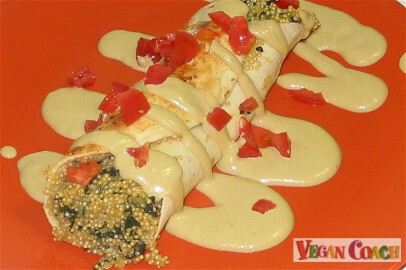 The main ingredients are quinoa and kale, with a yummy and creamy sesame seed sauce poured over the top. Quinoa is one of my favorite foods. And it's perfect in a burrito. High in protein, it's usually called a grain, but in all actuality is a seed. Look closely at the quinoa, and you'll notice a teeny tiny hole, which is where it used to be attached to the stalk. Interesting quinoa fact: No need to turn to cow's milk or soybeans for your protein, because quinoa comes closer to meeting the genuine protein requirements of the human body. 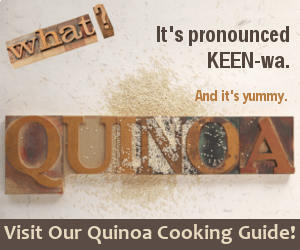 Eat your quinoa! 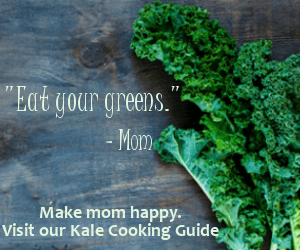 Kale is known for its bitter flavor, but that doesn't mean we should skip this extremely healthy green leafy veggie. The trick is to make it palatable. With the handy dandy Kale "Vegan Flavor Matches". These flavors match kale perfectly, and you can feel free to use any one or a combination of these ingredients to flavor your kale. But you can take it even further. When making a sauce to match your dish, you can focus on one of the main ingredients -- in this case, kale. One glance at the Vegan Flavor Matches for kale and you'll discover that tahini is a great match. And since tahini is made with sesame seeds, and I had some on hand, this formed the base for my vegan sauce. 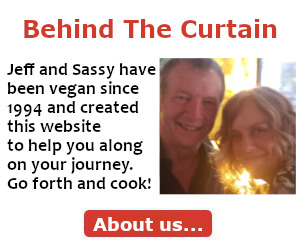 If you haven't yet discovered how important vegan sauces are to success with a vegan diet, then you need to listen up! A sauce can add sooooooo much to a dish. The trick is to create HEALTHY sauces so you can feel good about what you're eating. You can accomplish this by making sauces with whole foods. And all of this is done, easily I might add, while not adding to your waistline -- try to find THAT in a conventionally-made sauce based on animal products. 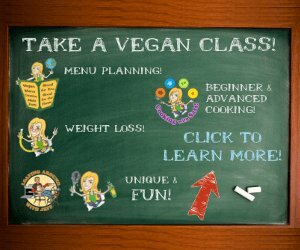 Vegan sauces help you to enjoy the creamy good flavors that a sauce imparts, while providing the fiber and nutrients we need. 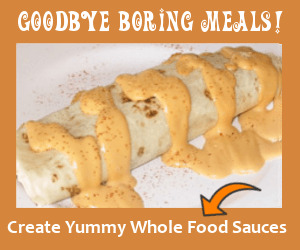 Add more sauces to your vegan meals—they really keep boredom at bay! Now, let's get back to our burrito. Step 1: Heat veggie broth in a large pan (with a cover) over medium heat. Add onion, and cook until transluscent. Add quinoa, kale, and veggie broth. Cover, lower heat, and simmer until quinoa is tender yet firm (about 15 minutes). Add more veggie broth (or water) if needed to complete cooking. Flavor your quinoa/kale combo in your favorite way. I used a little Tamari, nutritional yeast, lemon juice, garlic, sea salt and freshly ground black pepper. Step 2: In the meantime, make the sauce. Place all ingredients in a very strong blender and process until completely smooth. If you own a regular blender, you may have to grind the seeds first before blending with the additional ingredients. Step 3: Place filling down the center of the tortillas, roll up. Step 4: Plate burritos. Drizzle with Creamy Sesame Sauce.